Earlier this week when we had all the watercolor supplies out, we decided to take advantage of the free time and paint supplies to make egg art three ways. 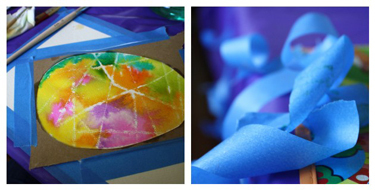 Each of these three ways utilizes sturdy watercolor paper, watercolor paint, painters tape and crayons. Here is project numero dos. You can see the first project here. 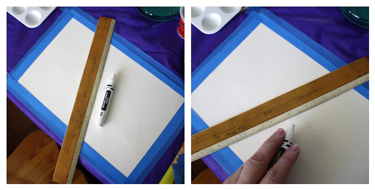 Tape a sheet of sturdy watercolor paper onto your work surface. this will both anchor your paper into place and act as a pretty matte once the tape is removed. Use a white crayon and ruler to create straight, criss-crossing lines all over your paper. Just go for it! The lines will be difficult to see but if you move your eye level down so that is skims the top of the paper you will see the lines. Point this out to your kiddo and let them talk about it for a few minutes. The nephew a-go-go really like this part. Next, take a piece of cardboard (we like reusing our cereal boxes and such for this) and cut out an egg shaped stencil. Save the egg shape part for project number three. 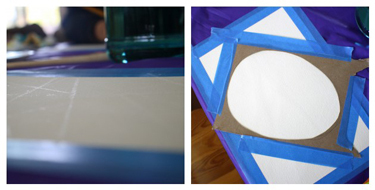 Tape down the remaining part of your stencil over your paper with painter's tape. Your kiddo can place the stencil wherever she or he wishes. Just make sure it doesn't scoot off of the paper. 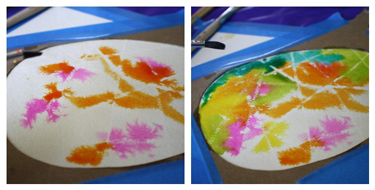 Dip your paintbrush into some clean(ish) water and have your kiddo paint over the area inside the stencil. We're getting the paper ready to receive and carry the watercolor. It's paint time! Dip your damp brush into preferred color of watercolor and gently touch it to the damp paper and watched it skate around. Begin with your lightest color first while ending with your darkest color last. Lookie how nifty the white crayon lines show through the paint. Ask your kiddos if they know why that happens . You can also take a little bit of time to explain that the wax is resisting the paint and that we call this a resist painting. Continue adding color and more water until you are happy with the results. If you allow the paint to sit and dry a little bit before adding more of the same color or other similar color you will have a nice layered effect. Remove your painter's tape once the picture is completely dry. Hang in a happy place, step back and admire! 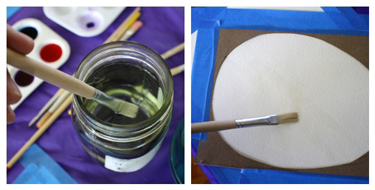 I love this activity and can't wait to introduce real water color painting to my 3 year old daughter. Thanks for sharing and I look forward to art project number 3. Thank you and I hope you have fun recreating your own egg art! a funny activity ma kids will love. because you never know how the egg will look like at the end. that is quite true! i hope you have fun with it! that last picture of the artwork shows the complete picture. 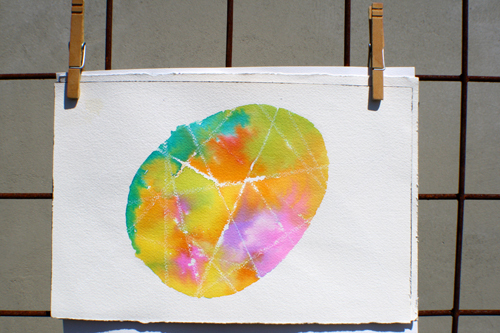 You remove the tape and the stencil leaving the watercolor egg all happy and alone! Thanks again and will be checking back on what you are up to..often! ooooh! thank you. gonna go see what you made, yay!